"This recipe makes a fantastic holiday meal, but everyone likes it so much that you won't wait for a holiday to make it again. Impressive as it looks and tastes, it is actually quite simple to make, and it's basically a meal in one roasting pan so even clean-up is a breeze." Allow the leg of lamb to rest at room temperature for 1 hour before cooking. Preheat an oven to 400 degrees F (200 degrees C). Place the oven rack in the lower third of the oven. Whisk the garlic, pepper, red pepper flakes, bay leaf, rosemary, 1/2 cup olive oil, vinegar, and honey together in a small bowl. Rub the mixture over the lamb, then season with 2 tablespoons coarse salt. Set aside. Place carrots, potatoes, beet, yam, and turnips in a large roasting pan. Toss with 2 tablespoons olive oil and a pinch of salt. Arrange the seasoned leg of lamb on top of the vegetables. 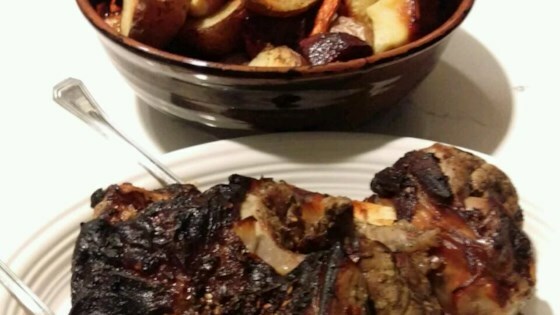 Roast the lamb in the preheated oven for 20 minutes, then reduce oven temperature to 325 degrees F (165 degrees C). Continue roasting to your desired degree of doneness, about 90 minutes more for medium-rare. An instant-read thermometer inserted into the center should read 130 degrees F (54 degrees C). Allow the leg of lamb on a cutting board, tented with aluminum foil, for 30 minutes before carving. Place the vegetables on a serving platter and cover with aluminum foil to keep warm until ready to serve. Reserve any rub you didn't use in preparing the lamb, and use it the next day to drizzle on lettuce on sandwiches made with the leftover lamb. Served for husband's 45th birthday dinner. Tasty and different. Served with Flathead Cherry Compote and Strawberry Blue Cheese Salad. Have made this twice now and love it. There's never any lamb leftover. Great flavor with lamb.